THE PERFECT HAM FOR THE PERFECT OCCASION. Special occasions call for a special ham. Over half a century ago, Hormel Foods set out to make a ham that was extra special, one that perfectly met consumer expectations and preferences. We consulted a panel of 1,000 women and, inspired by their ideas, created the perfect ham—CURE 81® ham. Made with handcrafted care and individually stamped with our Curemaster’s signature of approval, each CURE 81® ham is personally guaranteed to deliver the premium quality, flavor and tenderness ham lovers desire. With a passion for perfection, our Curemaster stands behind every ham at your table. In small skillet, melt butter over medium heat. Add onion and cook 5 minutes or until softened. Add 1 cup wine, honey, thyme and crushed red peppers. Simmer 8 to 10 minutes or until reduced by half. Remove from heat. Stir in mustard. Divide mixture in half. Heat ham according to package directions. Use remaining wine instead of water in pan. Baste ham with one half of mustard mixture and wine from pan during cooking. Serve ham with remaining mustard mixture. Serves 12. 1. Heat the oven to 300°F Use knife to score top of ham in a diamond pattern. Press cloves into the ham and place on roasting rack. 3. Mix together the cinnamon, mustard and ½ cup of brown sugar in a cup or small bowl. Set aside. In saucepan over medium heat, mix together the remaining brown sugar, cider vinegar, peach nectar and peach preserves. Bring to a boil. Stir in the sliced peaches, ginger, cherry pepper and the cinnamon stick. Simmer for 25 to 30 minutes, or until the peaches are tender and the sauce has thickened. 4. Remove ham from the oven and brush liberally with the mustard glaze. Increase the oven temperature to 300°F and return ham to the oven, uncovered. 5. Bake for an additional 20 to 30 minutes, or until glaze is bubbly. Allow the ham to rest for 15 to 20 minutes before carving. Serve with hot peach-Ginger sauce. Place HORMEL® CURE 81® Boneless Ham in shallow pan. Score ham; cover with foil. Bake 1-½ hours. Meanwhile, microwave remaining ingredients in microwaveable bowl on HIGH 30 to 45 seconds, or until cranberry sauce is melted. Reserve 1-¾ cups cranberry mixture. Remove foil from ham. Bake, uncovered, 1 hour or until ham is heated through, brushing with remaining cranberry mixture every 20 minutes. Transfer ham to cutting board; cover loosely with foil. Let stand 15 min. Slice ham; serve with reserved cranberry mixture. Increase the oven temp. to 425ºF and mix the glaze pack as directed. Remove the ham from the oven and spread the glaze over the entire ham. Place back in the oven for 5-10 minutes. When basting your ham, use a rubber baster. It’s easier to clean and won’t leave behind bristles! Prep as much food as you can the day before. This will make the day-of easier and less stressful. Less time cooking means more time with your guests! Layer your linens. Pair a simple tablecloth with patterned linens to add sophistication and pops of color to your table. Match your serving platters with the season or event. For example, use a wooden serving platter for a rustic event. For a more traditional setting, use a silver platter. 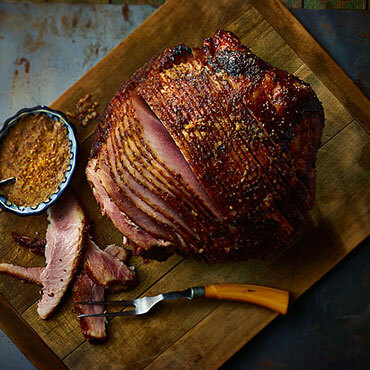 To get a juicier, more flavorful ham, glaze throughout cooking process. Set one timer for the whole ham, and a second timer for every 30 minutes to glaze. Garnish ham with herbs or produce that’s in season for a pop of color, such as squash, blood oranges or pomegranates. Use fresh ingredients from your ham glaze to garnish. Not only will it look good, no ingredients will go to waste. In the early ‘60s, we created the perfect ham. We called it CURE 81® ham. Then we put a Curemaster in charge to personally oversee the entire ham-making process. Today, Brian Hendrickson holds this important title, making sure all CURE 81® hams are expertly hand-trimmed for leanness, carefully cured and smoked over natural hardwood chips and packaged for goodness. Hams that meet the highest of standards for taste, texture and color are individually registered and stamped with the Curemaster’s signature—personally guaranteeing our ham’s premium quality. The Curemasters: bringing a half-century of excellence to the table. Food insecurity is an unfortunate reality that too many Americans face every day. Join Hormel Foods as we work to improve the lives of others with our annual HORMEL ® CURE 81® brand Hams for Hunger™ program. We’ve partnered with grocery retailers across the United States to donate over $13 million in hams since the program’s inception in 1989. From May through October, for every purchase of select HORMEL® CURE 81® ham and HORMEL® Smoked Pork Chop items, our retailer partners will receive more hams to donate to charity, up to 10,000 hams. These partnerships support local food banks, community outreach efforts, or disaster relief organizations by providing those in need with HORMEL® CURE 81® hams, donated during the holiday season in November and December. Help us reach our goal of donating enough hams for 1 million meals this year and bring us one step closer towards alleviating food insecurity. We’re committed to serving those who’ve served. That’s why we support The Fisher House Foundation, a network of comfort homes where military and veteran families can stay while a loved one is receiving care. Each year for Easter, we donate full Easter meals—each including HORMEL® CURE 81® ham—to feed every Fisher House throughout the nation. We’re proud of the program’s impact and the positive response we’ve received. By giving the gift of food, we give service member families the opportunity to eat together for the Easter holiday. 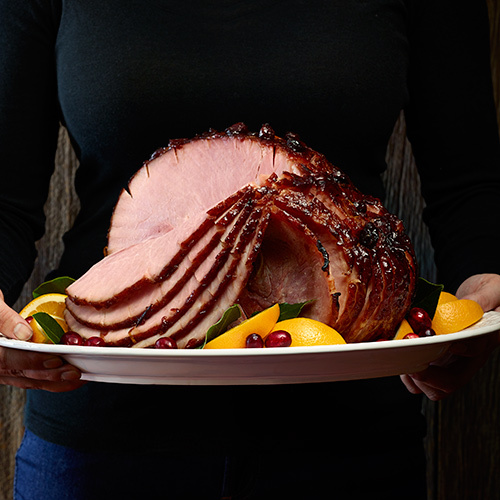 Our Cherrywood Ham’s sweet, smoky flavor brings delicious notes to your holiday meal. 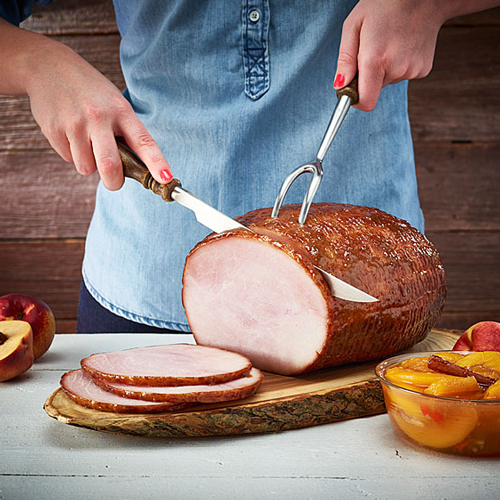 Enjoy the irresistible taste in this handcrafted, bone-in, spiral sliced ham. Premium quality and flavor are perfected in our boneless hams which are available in a variety of sizes to fit any occasion. Made with the highest standards for taste and texture, our irresistible bone-in ham will be the star of your table—perfect for holiday entertaining. Serve the versatile deliciousness of ham steaks. Their guaranteed tenderness is perfect as the main dish or a recipe add-in. Enjoy the premium quality and flavor of HORMEL® CURE 81® more often, ready to toss on and mix in eggs, salads and more. Here are a few new HORMEL® CURE 81® recipes we’re sure you’ll love. Check out our collection of crowd-pleasing ham recipes. We have something for everyone! Make it a meal with these easy, scrumptious sides.